This was the second time for me to see Yes. The first time was in Atlanta on the Union tour. This show paled in comparison to the Union show. They played at the amphitheatre in Nashville and the place was only a little fuller than halfway. I remember feeling sad for the guys in the band. I knew the Talk Cd very well. They just seemed to be having an "off" night. For example, at the beginning of Endless Dream, the ten minute epic for that album, Trevor Rabin played a keyboard intro and being a musician myself, i didn't have to strain to hear a few wrong notes. All in all it was very much worth the ticket price. Lastly they closed with Purple Haze. Try to imagine Jon Anderson singing Purple Haze. It seemed a little contrived. But that didn't stop them from remaining one of my favorite all time bands. There were a lot of Pink Floyd T-shirts seen at the Yes concert last night at Starwood Amphitheater. A musical era favoring expensive theatrics and technically flawless, focused virtuosity has given way to raw energy at the expense of musicianship. In other words, we're not in Kansas (or Boston) anymore. We're sleepless in Seattle. Though the lawn was predominantly empty, a surprisingly large, mature but enthusiastic crowd provided full support for the aging, balding art rockers. 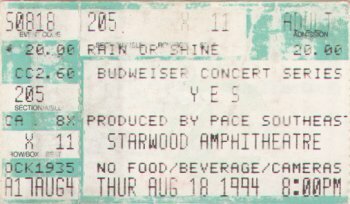 Like their Floydian counterparts, Yes has by no means forgotten how to put on a show. And while bassist Chris Squire's swashbuckling stage outfit fits a little tighter these days, his magic fingers have aged much more gracefully. "New" guitarist Trevor Rabin (who replaced Steve Howe for the 90125 album 10 years ago) is easily one of the most impressive axemen around. Unfortunately, lydian scales and digital effects aren't as appreciated as they were in the '80s. Vocalist Jon Anderson hasn't aged at all, so he thinks. "It seems like we wrote this song yesterday," said Anderson, referring to Heart of the Sunrise. "But people tell me we wrote it about 50 trillion years ago." Nonetheless, Rabin, Anderson, Squire, drummer Alan White and keyboardist Tony Kaye performed this complicated tune with finesse and enthusiasm as if they had just written it. Rhythm of Love, from the album Big Generator, and Owner of a Lonely Heart were given equal treatment. Music that is complex for the sake of being complex has its emotional drawbacks. By the same token, computerized lighting and elaborate stage sets can be considered a bit pretentious by some. Despite this, it needs to be said that the advent of grunge pulled the rug out from under art rock before it could reach its full fruition. For example, guitarists across the country are throwing their effects rack in the closet and yanking out wall-to-wall Marshall amplifier stacks again. Yes, whose stage is devoid of amplifiers of any sort, cranked out the best mix of any concert I've heard, period. Is it so wrong to want to hear the lyrics? Technology is there for a reason: use it. Most musicians would get offended if fans brought a Walkman to their concert and listened to the radio during the show. Not Yes. Instead, Yes is promoting the idea of bringing a radio to their concert tonight at Starwood Amphitheater. It's an experimental concept called Concertsonics. A radio frequency will be employed for the concert, and people whose seats are less than ideal for the sound can tune in and hear the event exactly as it's meant to be heard. "It's just experimentation," said Yes keyboard player Tony Kaye from a hotel room in Tampa. "But we've had some good reports about it from people on the lawns on this tour. You dial in, put it on, you got stereo. If you're at the front, you're in the middle of quadraphonic sound, so there's no reason to be doing it." The Arrow (104.5-FM) is giving away special headsets designed specifically for the Yes show, but many other portable radios will provide the same effect. It works, however, only in a specific section of Starwood. Move too far out of that designated area and the difference between the radio signal and the sound from the speakers creates an echo. Those who use the Concertsonics system will hear the music in much the same way that Yes hears it, since most of the band members use a similar system. Instead of hearing the music through the monitors at the foot of the stage, they use earphones that provide a mix with more clarity and without the sound of the audience. "It's a good thing, musically," said Kaye. "The ambience of the place doesn't matter anymore. You get the same sound every night, where before, you never knew what you were coming into with the sound of the auditorium you played that night. Now it's like being in a studio, so that's cool. The fact that you don't get the audience noise is somewhat disappointing though." Currently, Yes is touring behind the album Talk, an album with a raw texture harder than the group's usual approach. And as a result, Kaye says their music is a little more spontaneous on the current tour. "We change the music around a lot," said Kaye. "That is one thing about this particular band, as opposed to the Union tour in 1991, when we had a few band members who wanted to play it exactly the way it was. We play things a lot louder and maybe a little faster than they were ever done. They would have preferred to stand still, and that's a big mistake. "We're still creating. You play the arrangement the way that it is, but with the kind of clarity we're getting, you can experiment and branch out a bit with the playing." Kaye will branch out on a personal level for his Starwood appearance. The band has an extra off-day, and he intends to look for a home in Nashville with his girlfriend, Holly Wynn, a hopeful country/rock singer who has a band in Los Angeles. It's a rare day off in a brutal tour schedule: 64 shows in 62 cities in 8 2 days, and Kaye admitted they have "plenty" of regrets about the pace they've agreed to maintain. "It's a double-edged sword," he said. "We would like the time off, but everyday on the road costs an enormous amount of money. You have to weigh up the good and the band. Not to do anything for three or four days is very expensive, so they keep us at it. Actually, it's pretty good. If we've got six concerts in a row, a day off, and another six, that's pretty brutal. Four's OK, five you're getting tired, six you start cursing never at the audience." One thing about it: not every concert ends up on a radio. Thank you so much. Thank you. It's great to be with you this evening. Hey. It's great to be with you. We're looking for the rhythm. Need that rhythm. Looking for the 'Rhythm Of Love'. Need that love. Thank you. Many moons cascade one river. They light from side to side. As we cross in close proximity. Like rivers our hearts entwine. Like rivers our hearts entwine. Here's a new song from the album 'Talk'. Song about the music of the earth. Song about the music of vibrations that surround. Music of the sky. Music that keeps us together. Intertwined with the nature of 'Real Love'. The nature of the 'Real Love' that surrounds. 'Real Love'. Thank you. Thank you. Hey. You look great from here. You look really great. All people on the grass over there. I can see you. Introducing, magical sounds of the magical fingers. Mr. Tony Kaye on the keyboards. To sing the next song, our master of the lead guitar and our producer, Mr. Trevor Rabin. Thank you. It's seems..it seems like only yesterday that..uh we were writing this next song but someone told me that it was a zillion years we wrote this next song. Zillion years ago. It's true. We were living on this planet called Zongo and as you know, being Zongonian. We had to go every morning to the seaside to watch the sunrise coming up and make sure that it did come up. Because without the sun we ain't' going nowhere, right? So we got into all sorts of trouble and that's why we came here to Nashville. Yo! Featuring the co-writer of the next song. On bass guitar, the incredible, the wonderful Mr. Chris Squire. Thank you so much. Thank you. Thank you. Thank you. It's..uh sometimes you see these moths flying by. Night creatures and crawlers and they're wonderful because they say on the wings of moths is the dark gold dust of knowledge. Sounds pretty cool you know?. Someone asked me the other day said..uh 'You don't get tired going on the road?' I said 'I'll tell you. Being on the stage and being in front of a crowd like tonight makes life really worth living'. Because we know this is Nashville. We know this is music energy around here. So you make us play the way we are. We feel really good to be able to play the way we really are. That's because of you. Woo! Alright. Thank you so much. Thank you. Last year, most of last year we were recording the new album 'Talk' and I would go up to Trevor's house and listen to music, write songs together and just come up with ideas as you do and moan a little bit. You just gotta moan. Moan a little bit. Complain. It's part of the game. So I went up one afternoon and listen to this piece of music. I loved it so much. I had to write the lyrics down so I scribble these ideals and I sang the song and..uh to this day I can never remember the lyrics so I have them written down here and..uh couple of months later I sorta looked at the lyrics of what I was writing. Realized a little bit of what I was trying to say. Feeling that is sorta come on over the last few years. A feeling that our souls are eternal. you know? And..uh we never lose our loved ones and things like. So this song relates to that feeling. This is called 'Where Will You Be?'. Thank you. Muchas Gracias. In the distance you can here, yes you know. The maracas. Yes. Incredibly played, incredibly played so well that it belies words. So without further ado. The greatest drummer in the world, Mr.. Alan White. On the maracas Mr. Alan White. We're going to do a sing along song. Just..uh that means like..uh singing along thing. Sing along thing and it gives me chance to introduce you to a new guy on stage who's..uh playing acoustic guitar, electric guitar, keyboards, you name it, this guys doing it and singing. Mr. Billy Sherwood in the spot. Woo! Surrounding by smoke. Stop smoking that stuff Billy. For my love. Thank you so much. Thank you. I'd like to thank you all very much for coming out this evening. You are so wonderful. You sound so wonderful. You look so wonderful. One of the great things about being in a group like Yes, you get the chance to perform a song. This is a new song from the new album 'Talk' and it's real, as you would say, this is real Yes music because it just is that way. Here's a song, it's called 'Endless Dream'.